The digital revolution shook every company - in every industry - to its foundations. New technology became the lifeblood of organizations, offering the promise of substantial efficiency gains. However, the threat of that same technology being walloped by some upstart from Silicon Valley is more than alive. Until a few years ago, the success of companies that reinvented themselves to suit current technology standards was sort of, a myth. A “state” that won’t last. The example of the somewhat humble beginnings of Netflix, the cases of “Uber and the Transportation Industry” and “Airbnb and the Hotel Industry” are a blueprint for grand innovation. The digital disruption has created a new era of change, taking a toll not on the “weak,” but on the “stubborn.” If it hasn’t yet, it will. And probably sooner than we could’ve ever imagined. According to a study conducted by IMD and Cisco, digital disruption will displace four of today’s top ten incumbents in each industry in the next five years. What history tells us is that the winners are not necessarily the strongest, but the most flexible ones. And adaptation requires business agility which is “a combination of hyper-awareness, informed decision making, and fast execution”. So, the question is, how L&D must react to this change? To achieve business agility, training needs to be just as agile as the workforce — where speed, flexibility, and innovation are key. 1. Why is Agile Learning so Important? Bersin by Deloitte found that “organizations with strong cultures of leadership and learning outperform their peers.” Agile learning “enables the workforce to quickly acquire new skills and think out of the box,” which “enhances their ability to adapt and transform business, product, or process,” states the report. 2. Can a Company Survive Without Embracing Agile? 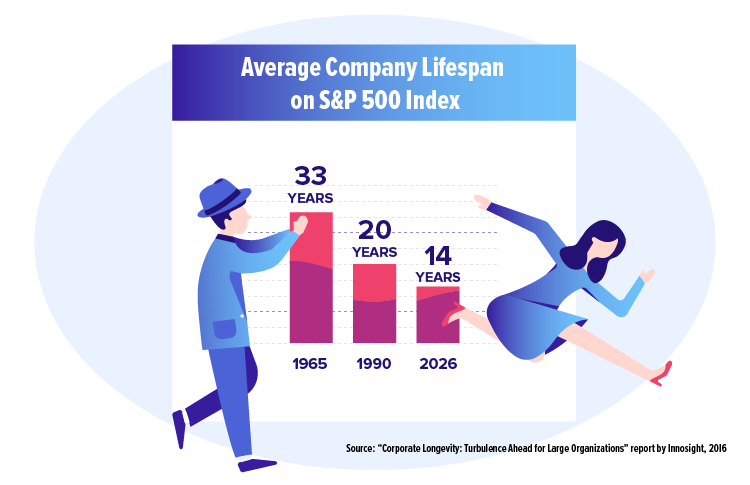 Contrary to the need of building the corporation of the future, many companies still rely on outdated structures and practices that give them zero competitive advantage. If enterprises want to thrive, they need to develop quality learning content. According to the 2017 Deloitte Human Capital Trends Report, only 12% of Fortune 500 companies from 1955 are still in business. The new technology and business models are disrupting more organizations each year. Just in 2016, 26% of these companies fell off the list. Successful businesses adapt their learning culture to meet the employees’ expectations and meet the customer demand. Companies that can’t keep up, ultimately run out of business. “In an era of rapid change corporate learning must respond quickly. 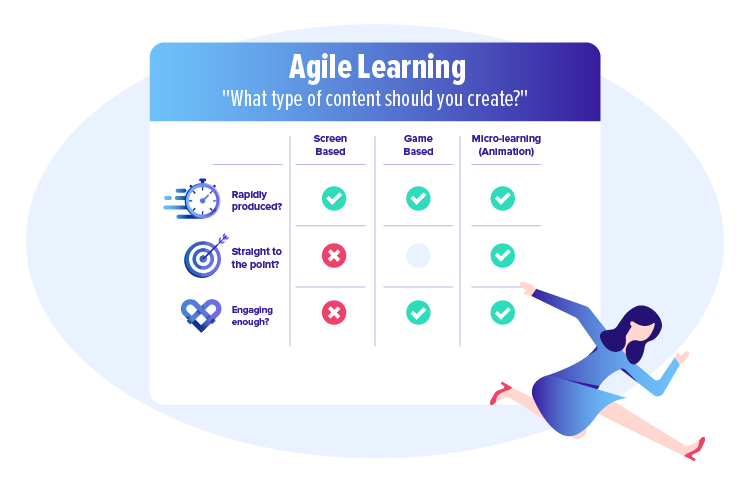 An agile learning approach means constantly keeping employees’ skills up to speed using learning content that aligns with rapid changes in the market,” advises Udemy. An agile workforce should quickly adapt to new technologies or business models. The change starts by accepting an agile learning culture. Experts encourage L&D professionals to identify the purpose of the content and think about it as an indispensable resource. Learning and development teams around the world are implementing engaging digital learning content that ensures efficient skill development and timely information update. 1. The ideal e-Learning content type needs to be rapidly produced. Companies need to step up their game and continuously deliver fresh content. Having a content advantage helps employees acquire the latest skills that keep them prepared for future change. 2. The ideal e-Learning content type is straight to the point. 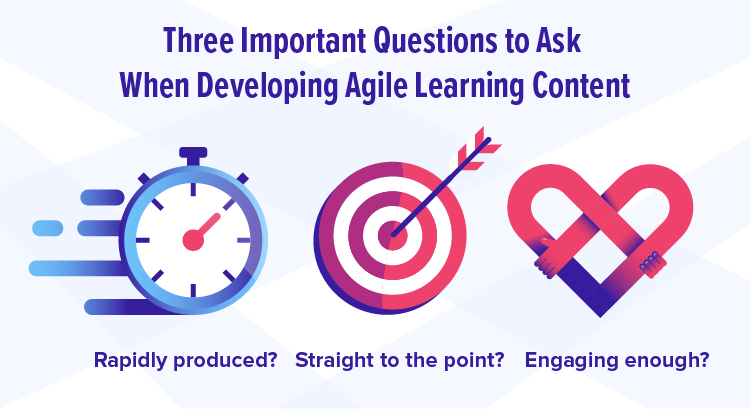 Given the lack of time for learning, agile learning methods need to correspond with the needs of the learner by delivering short, straight to the point information presented in an engaging way. 3. The ideal e-Learning content type needs to be engaging. Most companies use “Rapid eLearning” method which fits the two first principles, but fails to fit the last one. As Christopher Pappas from E-learning Industry argues, "The main issue with rapid eLearning is that it can often be rushed. Rather than including high quality, well-written content and images that are relevant and interesting, some designers might hastily integrate elements that simply don't offer any real value to the learners.” Thus, Rapid eLearning methods have the potential to decrease learner motivation and engagement. Employee engagement is the key to higher information retention. Unlike PowerPoint style e-courses, good storytelling and visual distribution of information engage and help the learner memorize the events faster. For that matter, using animated videos as an agile learning solution makes a lot of sense. As an example, Hitachi used a 5-minute animated video to train its employees about open enrollment. The video was produced in just ten days. And 75% of the target audience watched it (see the engagement graph below) until the end. It’s an impressive outcome since only 16% of viewers make a video through three minutes, web video services provider TubeMogul reports, after measuring 23 million streams on six top video sites over two weeks. Is the learning content rapidly produced? Is the learning content straight to the point? Is the learning content engaging? 5. Why do Different e-Learning Content Types Fail? For years, companies have been investing in e-learning solutions that don’t provide any ROI. Reports show that annually, companies spend $13.5 million per 1000 employees from ineffective training. Content types that are fast to develop are not engaging enough. On the other hand, more engaging e-learning content has long production time. The Chapman Alliance found that eLearning takes between 50 to over 70 hours for every hour of learning developed. Minimally interactive courses like text-heavy presentations, have the lowest hour development. Screen based PowerPoint style e-courses are simple and less expensive to make, but they no longer work. According to Forrester research, 70% of people who start an e-learning course never complete it. Medium interactivity courses take approximately 180 hours development for one hour of eLearning. More complex eLearning such as games and gamification show higher numbers, not only in production time but also in expenses. A game or a gamification project is engaging, but it takes around 2-3 months (sometimes more) to develop. A 2017 case study on gamification shows that it takes approximately 6 to 8 months to develop a banking online learning game. Video is quickly produced. According to Tugrul Turkkan, CEO of Vibons, an animated video platform that focuses on corporate learning and communication, the average production time of a 3-minute animated video (like this one) is 15 days, including copywriting, storyboarding and final delivery. That is two times faster than an HTML-5 e-learning, and six to eight times faster than a typical gamification project. Video is engaging. Video engages the learners’ visual and auditory senses, making them feel like they attend personal mentoring. The human brain is wired to process images far quicker than written text. The easy access to videos makes employees more interested in learning because they can learn at their own pace. Statistics show that 59% of executives agree that if both text and video are available on the same topic, they are more likely to choose video. Also, 54% of senior executives share work-related videos with colleagues weekly. Video is practical. Through storytelling, animated videos explain the occurrence of complex processes in a simple, understanding way. They compile the most important bits of big data into a short, insightful video. Instead of reading the instructions, watching abstract concepts that are difficult to comprehend helps the learner perform the needed process without any additional assistance. Agile encourages constant learning, innovation, and creation of a strong employee skill-set. Having video as a flexible learning solution allows employees to continually update and reinforce knowledge, acquire new skills, and increase productivity. Employees have the freedom to save the content, share it on multiple devices and use it anytime, anywhere. But, not every type of video-based training is agile. Information overload and distractions created a different learner. A modern learner that has exactly 24 minutes a week to spend on training and development. That takes long and tedious training videos out of the picture. Animated videos crafted with microlearning ideas compress the data and simplify complex information. In a case study, the company transforms a 28-minute screen based e-learning to three 4-minute videos. The content is divided into three digestible pieces, presenting the same information to the learner in less time. However, there is another challenge. Since the human attention span estimates to 8 seconds, the 4-minute video still needs to stimulate the distracted learner. The study further shows that by using an “animation or screen change” every eight seconds, animated videos have the power to attract the learner’s attention. By using storytelling, motion effects, infographics and animated visual metaphors, companies can create a dynamic and engaging microlearning. The power of short, animated video is in its flexibility used for simplifying complex topics using stories that activate the visual and auditory part of the learner, helping them to memorize the information better. This strategic learning can be repurposed to suit the needs of different groups of individuals.